if you look above a few posts, she already added you so you are good to go. just be sure you have created a store account with the same email you used for the forum signup. @androponic Thanks for the headsup! still a little edible groggy this morning lol got the account in the store all setup with my same email. Any idea what the current wait time is? @affiewolf@Hazel should be able to tell you your place in line. also, you cannot just put the at symbol to tag a user, you use the button above the message entry window and type the users name and pick it from the list. you will know if it worked because it will be in blue text like mine here. If she hasn't already added you to the list. Start here. Man, I feel for all of you waiting. Hang in there. Sorry to see the first G43 casualty a while back. Is your Quick soak method like Bud's vid or different? So there is enough convection heat produced that it isn't necessarily a need to fill the slide? I do want to avoid taking my G43 apart until I've taken it places first. So perhaps at home I'll break out the cyclone bowl? I have some manual dexterity. But panic when things don't come back together smoothly. :sweat: Would like to avoid a tear down until months after being on the field with some preventive maintenance.And get more reports from others about their best method tear downs. From what I've gathered, if you are the most careful handling the G43 when beads are removed and reinserted then many of the things that could go possible go wrong are skirted. Take your time when you swab out the top part of the slide because of the exposed wires. I'd think that the glass oven would be somewhat self cleaning. Like a glass bamboo only better mass small beads and glass rod but use less voltage. Then again I've use the G43 upside down or sideways. Is that a no-no? I do hope it is cool to use in any direction. Anyone have any two cents to give here? Also thinking and concerning myself more about hot spots forming as a thing now. I do see the occasional bead turn red and take that as my signal to take a draw and perhaps power off/down the oven. Also looking to protect the wires a little more and get familiar with that. How far away and remote from home has anybody used it? How portable did you go exactly? #51 here, never taken it apart. It gets pretty heavy use, and the most I've had to do is an ISO soak once when it got dirty. And it probably didn't even need it, I'm just a clean freak with all my stuff, lol. My general maintenance is with an iso moistened q-tip, to clean the bowl area when it gets dingy. I also soak the outer screen when I wash my ELBs. Hey @Hazel, I think I am #257 on the list and was wondering how many of the original 100 mods that Bud purchased are still available. Trying to see if I would need to buy one on my own or do you think there are enough left that I could still add the mod when my turn on the wait list comes up, thanks!!! Did my first full cleaning today, besides getting the screens out, the rest of the process was pretty easy. Make sure you keep the beads in a little cup or saucer, I didn't and it was a pain trying to recover all the little beads off the floor. Wait to get the flavor disk (healthstones) from Bud when you get your G43. That way you will be guarenteed the 11.67mm healthstone from 7th Floor is actually the incorrect size of 10mm which is what you need in the G43. I would get some LG H2's for your G43....they take the abuse and work well.....my fav 18650 cell! I have 6 of them for my G43. 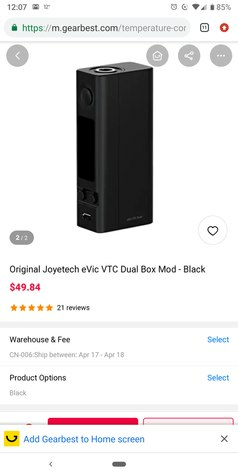 I can not help much but tell you to look hard on the net for a Joyetech VTC Dual mod...they are not discontinued and hard to find. I do not know of any other multi cell mod that has been working with the G43 yet....the Wismec ones had issues of overheating. Other thing.....get a good external charger.....I use a 2 slot nitecore that works on any size cell and also works with different types of batteries....so I can use my NIMH AA's in there too. No need to dissemble the vape to clean it.....I posted this way back a couple months ago I think in this thread....but get a curved tipped syringe (like from a dentist to flush out areas) and just squirt ISO down the top and through the beads to drain out.....several times....then do the same with water.....then blow through the top end and use a hair dryer to dry it completely.....done deal. You can soak it up to the handle safely.....that will break up stuff first before you go for the squirting deal and make it go faster and get cleaner. @LabPong thanks. I'll wait on the health stones. Do you have a link for the lg h2's? I know there's a lot of shady battery dealers out there. (Preferably Canadian). This is the correct mod right? Yes that is the mod...here is the manufactures page on it It has an extra back case piece so you can go from 1 or 2 cell use. I buy my cells from IMR in FL. I know you hoser's in the great white north have a hard time getting good quality 18650's at a low cost like us in the US. I can't really help there....but to ask other Canadians to chime in with cells there. Yes, we got more of those mods and sell them in our G43 Kit so you should be all good to order one when you're up! :cool: :100: It's one of the questions when you pick what you want - do you want a mod - yes/no lol So we got you! :fire: :cheer: We also have them pre-loaded with firmware. Alrighty need some help. Tried the search function and didn't see anything. Got a new rig (double matrix) and went to switch the G43 over to it and I'm getting "no atomizer" on the mod. Anyone? one of the connections sounds loose. Unplug the quick connect, then the rda from the mod. Change your battery, then reconnect first the rda then G43 quick connect. If you're still having trouble it's probably a short and you should hit up Bud for troubleshooting. From what trusted site are you purchasing your LG H2's? Ha! I remember reading that post and thinking at the time how brilliant it is and how I'll be using your cleaning method but of course I forgot all about it, lol. Everything is working in proper order so I guess I didn't lose too many beads. Even better is that I am able to drop the wattage down to 12.5 watts now as to 13.4 watts prior to the cleaning.